It is already over. Stand down. You have as much chance of winning the Labour leadership this year as a snowball has of surviving a guided tour of the Earth’s core. You have already lost. Of course, I had my severe doubts about your chances right from the moment there were whispers that you might make a challenge to become leader; partly because I was only dimly aware of who you are. If I have trouble placing a face to the name when I follow the political scene, what hope did most rank-and-file Labour Party workers have? Today, I went from doubting your chances, to knowing you have no chance. For today, I was at the Lowry Theatre in Salford Quays, attending the launch event for Jeremy Corbyn’s bid to retain the leadership of the Labour Party. The atmosphere within the Lyric Auditorium was just unbelievable. The sheer weight of feeling in that chamber, duplicated in other cities all over the country, was energised by the weight of an idea that far exceeds the ‘appeal’ of your plastic Public Relations ‘skills’. You may not even fully understand what I mean by all this, Owen, but that only underlines how far beyond your depth you are swimming. You do not even know what you have chosen to take on, what you have put yourself up against. What you are up against is a movement – a movement that is for an idea, and not just vindictively against an individual. Even with all the dirty attempts by the party’s National Executive Council to force Corbyn supporters off the voting lists, you, Owen, are still going to get pulverised if you continue, because that idea I speak of is already out there amongst the majority in the party, and among many beyond. The genie is out of the bottle, Owen, and it sure will not go back in simply at your say-so. Your lack of real experience in Parliament is what blinds you to the scale of the task you are facing, while your lack of experience among grass-roots supporters and ordinary people blinds you to how unappealing your leadership appears. You have nothing to offer, nothing. All the speakers at the launch event had more to say in the opening sentences of their speeches than you had in all the speeches you have so far delivered combined. Rebecca Long-Bailey, Sam Wheeler, Yasmin Toor, most particularly Richard Burgon, and others besides; they spoke, every single one of them, with the charisma of sincerity. They believed in what they said, every word, you could sense it when listening to them, and it connected to supporters in a way of which you, Owen, can only dream. And this is the critical point; they are on Corbyn’s side, they are not on yours. You, Owen, keep contradicting yourself in interviews, and you try to compensate for lack of clarity with an obviously fake show of ‘affability’. Corbyn may not be a great orator, but he is at least as good a speaker as you, so you need supporters who will speak up for you, as the other speakers did for Corbyn today. But whom do you have who will fight your corner with the same fire and eloquence as Burgon, Long-Bailey, Wheeler et al? And then there is Corbyn himself; when he stepped onto the stage to address the crowd in the Lyric, the ovation he got was just ear-splitting. Just across the quay from the Theatre is Old Trafford Football Ground. Even when it is full to its 80,000 capacity, I swear it can get no louder than the ovation about 2,000 gave Jeremy Corbyn today. As he spoke with his usual, relaxed, mild-humoured clarity, and his kindly, engaging sincerity, giving us more substance in a minute than Tony Blair gave us in ten years as Prime Minister, everyone in the room was with him, applauding and chanting his name. The ovation he got when he finished speaking lasted for minutes on end. His charisma may not be the same type as the traditional, aloof, ‘Alpha-male’ figure of convention, but he still has a charisma that you lack. Do you not believe that? Well, I went to a Momentum meeting in Liverpool just two days ago. There were hundreds crammed into a hotel conference room with poor air conditioning on a humid evening, but no one was sapped or stifled by it. It had a similar vibrant atmosphere of drive and commitment. And everyone there was well aware that Corbyn would not even be able to attend. Think about that; they showed up in their hundreds to show their support for Corbyn even when he was not going to be there! For you and your allies to keep suggesting that this man is ‘unelectable’ when he is the only politician in the country to rally hundreds of thousands to his banner over the last year is frankly doublethink. Meanwhile, Owen, you have nothing with which to counter any of this. You have no vision, no inspiration, no experience, nobody’s trust. You are unable to mobilise support in anything like the same numbers, or with even a fraction of the drive, passion and commitment, that your already-elected leader can. The Parliamentary Party in the main will support you, but not because they really want you to be leader, but because they fear what Corbyn stands for. Your support is built on a negative. Even events you attend in person have tiny numbers of supporters showing up, and most of them looking half-comatose as they try to remember to hold up the signs saying, “Owen Smith 4 Labour Leader“. There is not the slightest chance of that sort of half-hearted semi-interest from followers of Jeremy Corbyn. Do you know why? Because all you are offering your party, in place of this man of the people, is another PR man, which to them is effectively nothing. It is nothing to them, because they have endured nearly a quarter-of-a-century of ‘New Labour’ PR and now know how to recognise it straight away. They have experience of how much your brand of PR promises them at first, and how little it delivers in the long run. They are no longer willing to indulge it. You as leader would simply be another Tony Blair, and that is not the good news you think it is; by-and-large, people no longer like Blair, they have come to recognise him as the violent, deceitful plutocrat he undoubtedly is, and some are even ashamed they ever voted for him. You will not win elections by emulating him. But that is what you would have to do, because when all is said and done, you have no gift for doing anything different. What they want is something they have lacked for a generation, and that is someone to represent them, not just someone to represent the banks in a way that allows the little people a few extra crumbs. All of this means that you are not a true ‘challenger’, Owen, you are merely a roleplayer. Your only role is forcing your party to waste precious time and resources re-doing a process that was completed and finalised without any ambiguity less than a year ago. This pointless ‘coup‘ has already squandered a priceless opportunity to attack the Conservative Party over the ‘Brexit’ fiasco, which had left their own party in turmoil for weeks, but from which they have now been allowed to regroup with little harm done to them. By engaging in this ridiculous leadership challenge, you are simply handing the Tories more freedom from effective opposition. No one will thank you for that, except the Tories themselves, and they are supposed to be your enemies. Give up, Owen. You and your supporters in the PLP are trying to fight the tide itself. You are all in denial of the reality that the ‘New Labour’ experiment had fully run its course at least eight years ago, and is now as obsolete as the party model of the 1970’s – which no, Corbyn is not trying to restore. So why not let your party cut its losses and at least get back some good will from the grass-roots you will still need to rely on in future? You have lost anyway. FOREWORD ADDED 16-7-2016: I have concluded that this is not a false alarm, as mentioned in the first paragraph below, as there are ways to interpret the information to suggest that the deadline mentioned does extend to the party leader. But it is a grey area. Please see the second update at the foot of the page. This news is in its infancy, and it may prove to be a false alarm, but the word is circulating on social media that the challenges to Jeremy Corbyn as Labour leader by Angela Eagle and Owen Smith may – MAY – have broken Labour Party rules. The violation appears to have been identified initially by the Campaign for Labour Party Democracy. The Campaign has highlighted that, according to the Labour Rulebook, there is a deadline imposed by the party’s National Executive Committee each year for nominations to the NEC, party treasurer, auditors, Conference Arrangements Committee, the National Policy Forum and the National Constitutional Committee. That deadline explicitly extends to nominations for the positions of party leader and deputy leader. Angela Eagle and Owen Smith have missed the deadline for getting nominations for leader, and the rules say they can’t stand. Chapter 3, Clause III, sub-clause (2)(E) of the Labour Party rulebook 2016 requires nominations to be made by a closing date set by the NEC. The NEC decided closing dates through its Organisation Sub-committee at its 20 October 2015 meeting, and set the deadline for ‘national officers’ election nominations as 24 June. The rulebook says the leader and deputy are national officers. So it appears that Eagle and Smith missed the deadline for leader nominations by more than two weeks. Eagle was on the NEC when they set the date, so she’s got no excuse. As the CLPD mention above, they understand that the deadline selected by the NEC for 2016 was the 24th of June. Angela Eagle did not formally announce her challenge to Jeremy Corbyn until the 11th July, and Owen Smith did not announce his challenge until the 13th of July. If – if – all of this holds good, it could well mean that both Eagle and Smith missed the deadline, and are thus ineligible to stand for party leader this year. Firstly, the deadline date mentioned of 24th June is only a whisper, I have not been able so far to find a copy of the minutes of the October meeting in order to verify that it is correct. Third, the rulebook does not stipulate any firm bar against any candidate standing after the deadline i.e. it may be possible to interpret it as a ‘guideline’ instead of as a rule. Fourth, the rulebook does not set a deadline against challenging, it only sets one against submitting nominations for the leadership. It is just possible that Eagle (though probably not Smith) may have submitted her nominations to the General Secretary before the cut-off, but did not commit to challenging until this week, which is not forbidden by any of the rules. It is far from confirmed as yet, but if I were Jeremy Corbyn, I would certainly be looking into this with considerable interest. Watch this space, I will add any updates below, after this has been verified. Arrangements Committee, National Policy Forum and NCC shall be sent in writing on the form provided to the General Secretary at the offices of the Party by the closing date agreed by the NEC. In other words, it has not been revised, and the rule definitely still stands. The important questions that remain therefore are whether we can find evidence that the NEC sub-committee really did post a deadline of 24th June for nominations, and whether that has been formally reversed subsequently. We still need to be very clear about this though, it might all prove to be nothing. UPDATE 22.55 on 16th July: Thanks to Gary Peerless – see comments section below – for providing me with a link to the minutes of the October meeting from last year. They can be seen on the Grass Roots Labour website. Minutes from the Labour NEC’s Organisation Sub-Committee meeting on 20th October 2015. They do appear to impose a deadline for nominations to the Labour leadership, which Angela Eagle and Owen Smith seem to have missed. The organisation committee’s minutes were taken by Ann Black, and are somewhat brief. But perusal has led me to conclude that the suggestion that there was a deadline set for leadership nominations is possible, but not explicit. Some other key dates: the deadline for conference delegates would be 24 June 2016, and this would also apply for nominations for the NEC constituency, local government and parliamentary places, the treasurer, auditors, the conference arrangements committee and the national constitutional committee. This passage does mention the 24th June deadline, but does not mention leadership or deputy leadership nominations as such – not explicitly. However, as is so often the case with Labour Party official documents, the wording is somewhat ambiguous. The term ‘parliamentary places’ potentially covers the leadership of the party. I am pretty sure that the meaning is parliamentary places on the National Executive Committee i.e. ‘NEC’ is the prefix for all three categories, and ‘places’ is the suffix for all three. Hence: ‘NEC constituency places’, ‘NEC local government places’, and ‘NEC parliamentary places’. Now, people might cite that as grounds for dismissing the objection, saying that places on the NEC are quite separate from the party leadership. But to do so is to ignore a very important detail; within the present structure of the Labour Party, the leader of the party automatically has a seat on the NEC. So the reference to NEC parliamentary places does appear, on balance, to include Jeremy Corbyn’s position. It is a grey area, but the case could well be sustainable, unless there was a formal extension put in place before the deadline passed – of that, I am unaware. I have searched quite extensively on search engines using various terminology, but can only find references to a deadline extension for nominations in the leadership contest back in 2010, not for this year. I think Corbyn and his allies should at least look into raising the matter with the NEC. With the Labour Party NEC trying every dirty trick to prevent the ‘ordinary’ people from voting for their leader, this is an intelligent and generous method for getting more people in as full Labour Party members. As most of you will know by now, the Labour NEC met yesterday initially to determine whether or not Jeremy Corbyn could feature on the leadership ballot. They ruled that he can, but they simultaneously ruled that those members who joined after 12th January 2016 would not be eligible to take part in the election. Additionally, a charge of £25 will be levied to register as a Labour Supporter, a significantly higher fee than the £3 previously charged. At a time when British people are once again reinvigorated by politics and political change, and clamouring to take an active part in their party of choice, they are being denied this chance. Jeremy Corbyn has inspired unprecedented growth in the Labour party membership, and those new members, and those who wish to vote in the leadership contest, should not be denied a chance to vote. Even as I was finishing up writing last night’s blogpost, the outcome of the Labour National Executive Committee’s deliberations, over whether an incumbent can stand in a Leadership contest without nominations, was being announced. They ruled by a vote of 18 to 14, to the delight of most party members up and down the country, that he can. Jeremy Corbyn will therefore be on the ballot of the upcoming contest against Angela Eagle no matter how many – or how few – nominations he gets from the Parliamentary Labour Party. However, the ‘Red Tory’ faction on the committee, being the sort of people they are, could not resist a final sting-in-the-tail; in their terms, that always means a dirty trick. This took the form of a second vote that was not announced on the meeting’s agenda, and not even called until a number of committee members, all of them Corbyn supporters, had left the building. The motion was to bar any members who have joined the Labour Party since February 2016 from voting in the Leadership contest. The motion was passed. This vote could be unsustainable, and even illegal. Firstly, the possibly unsustainable; as the discussion of the motion was not placed on the agenda beforehand, and was called without any notice or forewarning only after some committee members had left, it is highly questionable whether any decision made in such an underhand manner can be seen as representative of the committee’s deliberations. Secondly, the possible illegality; please click the link here. It will take you to the page on the Labour Party’s website promoting membership to potential newcomers. Check the section, roughly halfway down the page, marked, Where could my membership take me? It lists off some of the benefits available to people who join the Labour Party. “You’ll be eligible to vote in leadership elections”. That sentence has been on that page for a long time, and is still there even now. As the page is on Labour’s own website, and links directly to the page for people to join up, that has to count as a binding pledge. In the end, I doubt the dirty trick will make all that much difference on its own, as Corbyn clearly still has overwhelming support in the national party. Eagle has very little hope of competing effectively against him, and even the newly-announced candidacy of Owen Smith is likely to do little better. Furthermore, there are already ways being developed for new members to get around the ruling, including via membership of Unite The Union – subject to confirmation and certain conditions. But last night’s dirty move is still an example of how vile the ‘Red Tory’ faction of the Labour Party become whenever democratic or legal processes do not give them the outcomes they want. These people are only in favour of democracy when it arrives at the decision they already made beforehand, and they only like laws that allow them to obstruct the alternative. For this reason, there may well be more dirty tricks and contrived obstacles ahead before the contest is over. As I mentioned a few days back, the rules of the Labour leadership contest are not ambiguous, but the ‘Red Tories’ and their allies in the Labour Party are insistent that the rules on nominations have been misinterpreted. Even as I type, the party’s National Executive Committee is in the midst of heated discussion of how the rules should be understood, and the outcome of these deliberations could be announced at any time. Sadly, my fear is that the decision is liable to be settled on the basis of whether more people on the Committee support Corbyn or oppose him. That will be a corruption of the process, regardless of the outcome. It appears to be the use of the word any that the rebel MPs are saying can make the rule apply to the incumbent leader. In isolation, that part of the sentence can indeed appear to mean exactly that. However, when reading the paragraph in full, we can see that this is in fact a nonsense interpretation. Indeed, it is a classic fallacy. The words any nomination have, in effect, been ‘quote-mined’, i.e presented out of context to make their apparent meaning differ from their actual meaning. By only focusing on the words any nominaion, the rebel MPs are ignoring the fact that they are preceded by the words In this case. That in itself establishes specific conditions and circumstances would have to apply, thus reducing the scope of the word any. Furthermore, the term, In this case always dictates that the sentence must refer back to conditions itemised in the previous sentence or sentences. Sure enough, when you follow that reference backwards, you see that the nominations in question are explicitly referred to as being sought by potential challengers. The incumbent, by definition, cannot be a challenger. Indeed, at no point does the rulebook establish that a nomination is the same as a candidacy. Nor should it. Therefore, the word nominations cannot objectively be interpreted as necessarily referring to all forms of possible candidacy. An incumbent leader, so long as he or she wishes to continue the role, is another form of candidacy. There is no restriction on an incumbent leader’s right to stand mentioned anywhere in the book. It would probably have helped if it had been worded as ‘any such nomination’, to set in stone what was being referred back to, but even without it, it is still quite clear from the context that challengers, and only challengers, are subject to this clause. Even if the wording were genuinely ambiguous, without an explicit reference to the incumbent, an impartial observer would probably still rule in Corbyn’s favour. The Red Tories’ position is, if not ridiculous, then certainly counter-intuitive. Their stance on sub-clause ii can only be sustained through biased interpretation. That interpretation is entirely possible of course, especially with shameless Blairite-sympathisers like Margaret Beckett on the Committee. But if the NEC does indeed bar Corbyn from standing, the ruling can and will be subject to a legal challenge. I went to a demo at Piccadilly Gardens in Manchester today. The demo was arranged to press for Tony Blair to be prosecuted for the 2003 Invasion of Iraq. It was not a great turn-out, partly because of other events around the country, especially in London and Liverpool. But it was heartening to find that, even if the human population of Manchester was not widely mobilised, the avian population was well in attendance. I know this, because, while a small group of us were chatting together after the speeches, this little activist came waddling over to join us; to offer, I like to think, views on Iraq and Palestine. A helpless, lame pigeon that waddled across Piccadilly Gardens during a demo against Tony Blair. The poor little lady – well we think it was female – appeared to have a busted wing and leg. As she moved, we saw she was struggling. Her frame was stubby, over-rounded, top-heavy and ungainly. The lame leg and wing were bad enough, but she also had little legs. She was stooping, and had narrow, tired-looking eyes that suggested sleepless exhaustion. So there the pigeon was, hobbling around, hunched-over, making unconvincing, frequently-aborted attempts to take off, blundering into a scenario over which she had no power to control, battling through a helpless situation against overwhelming odds, and looking around through beady eyes in fearful desperation for someone to tell her what she should do next. So we decided to name her ‘Angela’. DISCLAIMER: Our apologies to Angela Pigeon for this extremely insulting comparison. We realise that her contribution to our discussion was easily more coherent and persuasive than anything Angela Eagle said to Andrew Neil this morning. For this reason, we expect speculation to spread rapidly that Angela Pigeon will eventually challenge for the Labour Leadership; the #ChickenCoup is now succeeded by the #PigeonCoup. Never mind, Angela Eagle, third place will still be better than you did in the Deputy leader contest last year. Tony Blair, in response to the condemnation he got from the Chilcot Report on Wednesday, seems to think that more outright denial of plain reality will cool the atmosphere. The former Prime Minister’s press conference in the hours after Sir John Chilcot made his statement was contradictory and misinterpreted the Report. These fallacies ranged from Blair saying he accepted ‘full responsibility’ in the second sentence having emphasised that the invasion of Iraq was US-led in the first, through insisting that the Report cleared him of misleading behaviour when it stated quite emphatically that he had presented evidence with ‘a certainty that was not justified’, to insisting that the war had been the right decision, in spite of the Report finding there had been no need for it as peaceful options had not been exhausted. Blair continued this behaviour on Thursday in an interview with the BBC. When John Humphrys argued that Blair had simply ‘wanted’ war, he rejected this, but then admitted that he had come to believe that Iraq had weapons of mass destruction. Whether Blair specifically desired a war is therefore neither here nor there; his belief distorted his perceptions, and so he treated intelligence with confirmation bias. He had decided that war was necessary, and so hunted with prejudice for evidence to support that case, rather than assessing evidence first and deciding whether war was necessary on reflection of that. Blair was also found to have made decisions that should have been referred to Cabinet, by-passing scrutiny or potential objections. His defence, in short, offered no defence, while he admitted his tendency to trust his own blind belief over physical facts. 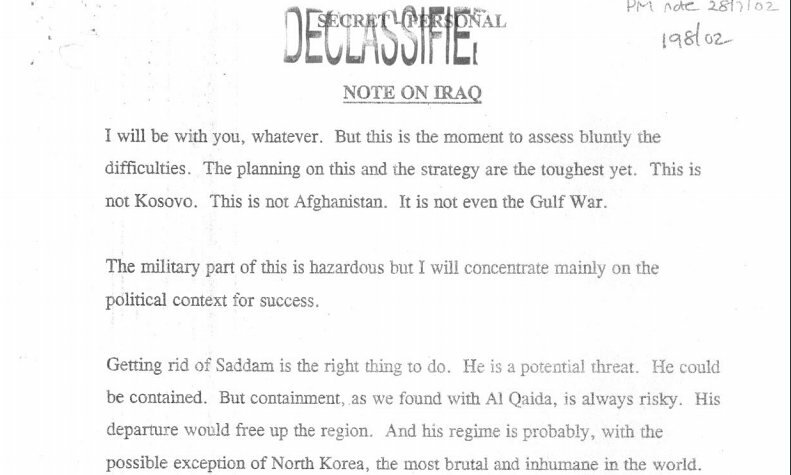 Tony Blair’s memo to the US President committed Britain to support the US in any war in Iraq. Blair insisted that this was not an irrevocable commitment to war. He pointed to how the next sentence began with the word But, implying that there were conditions and provisos. This may look at first like he is objecting to being ‘quote-mined’ i.e. that his position has been misportrayed by a single sentence presented out-of-context. However, I would counter that he is quote-mining himself. But this is the moment to assess bluntly the difficulties. He is asking that an assessment be made forthwith of the difficulties of a military operation, he is not laying out any terms that must be met before he would back it. He is detailing a preference, not a condition. As for I will be with you, whatever, it may not exactly be an irrevocable commitment to war, but that would only be because the war itself may not have been inevitable at that point. It undoubtedly is a commitment to it in the event a war happens (which, let us be honest, was already looking very likely by that point, especially given how casually bellicose Bush tended to be). Blair committed himself to match American policy in any direction it was taken, including war, and in any circumstances; that is what the word whatever means. The commitment to war could have been revoked, but not by Blair. He handed that power to Bush, a blank cheque. Nor do protestations that Blair convinced the USA to bid for United Nations support before invading offer much defence. Both he and Bush rejected the UN’s decision when it found against war, establishing the whole move as ‘for-show’. Blair’s career has always been about spin, and here he tries to spin the Chilcot Report as an exoneration, at least of his intent, when it is almost as scathing of his intent as it is of his judgement. Blair decided to go to war long before Parliament got to vote on the matter, and he focused on framing evidence in a way that would invite support. Chilcot’s conclusions do not clear Blair of that – indeed that is, on balance, the likeliest explanation for what Chilcot has found. All very reminiscent of the manner in which Blair’s old friend and spin-mentor, Peter Mandelson, responded to the Hammond Inquiry fifteen years ago, painting it as an unhesitating exoneration. In truth, Sir Anthony Hammond’s report into the ‘Hinduja Affair‘ essentially stated more that Mandelson’s incorrect behaviour could not be proven than that it did not happen. Spin depends on two conditions – public laziness, and public stupidity. Blair is assuming most of the public will be too lazy to bother checking his claims, while the few who do will be too stupid to identify which details prove him wrong. Blair is insulting us. I suggest we do not let him get away with it.